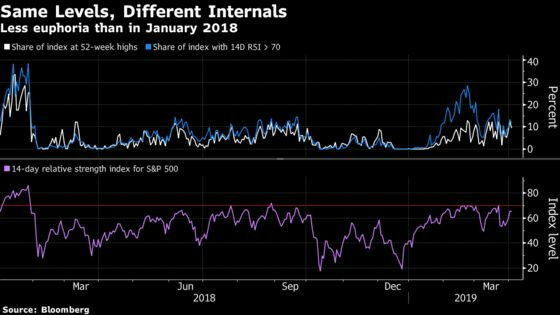 (Bloomberg) -- As U.S. stocks continued to climb toward a record, a major benchmark surpassed an ominous level for volatility watchers. The S&P 500 topped 2,875 for the first time in six months, a level the index initially passed 16 months ago -- one day before a record blowup in the Cboe Volatility Index. A look under the market’s hood might calm any jitters. This is a fitter, less-extended index than the one that collapsed last February. Back then, euphoria dominated after tax cuts looked set to juice profits and buybacks. When the S&P 500 hit a record Jan. 26, a quarter of its members stood at 52-week highs and nearly 40 percent were overbought. Today, just one in 10 stocks is at a yearly high, and a measly 10 percent have relative strength measures that top 70, underscoring a lack of exuberance for U.S. stocks. It’s a continuation of a year of subdued investor reaction to stocks, with the index rarely in overbought territory since the so-called volmageddon. Relatively moribund growth abroad and the recent inversion of the three-month, 10-year Treasury curve have suppressed aggressive risk-taking as investors remain vigilant for the possibility of an end to the near decade-long U.S. expansion. If the lack of greed is what’s different this time, the accompanying lack of fear is what’s more similar. The VIX is in the low double-digits now, an echo of last January. Realized volatility is also subdued. Positioning data implies that shorting VIX futures is similarly dominant, but without the same depth as in early 2018. The implied calm is particularly acute among the leading industry groups in the market: technology hardware and equipment, semiconductors, and software and services, which have all booked gains of more than 20 percent year-to-date. Traders appear to be betting that there’ll be no tech wreck in upcoming quarterly reports. 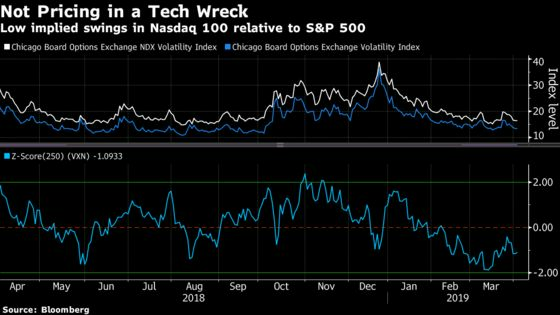 The spread between the Nasdaq 100’s fear gauge and the VIX index is more than one standard deviation below its one-year average. Lawrence Hamtil, a financial advisor at Fortunate Financial Advisors, notes that the sector’s heavy exposure to foreign markets paints an unflattering picture for earnings season. 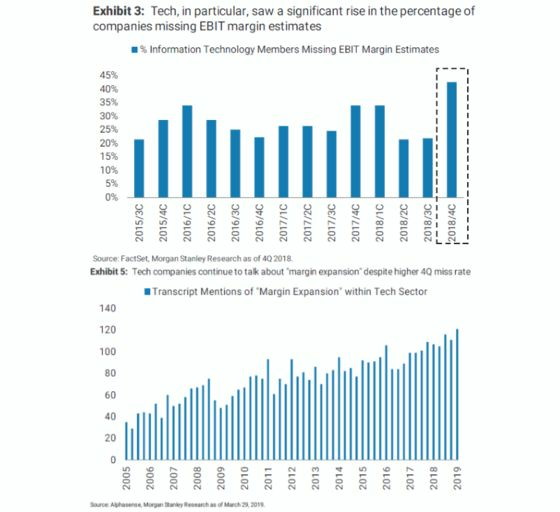 Potentially compounding the woes: Tech executives and shareholders are currently whistling past the profitability graveyard, according to Morgan Stanley chief U.S. equity strategist Michael Wilson.